Hi, My name is Marley! I am a Reddish brown; short-haired Female Dachshund/ terrier mix Dog. I am 6 months and weigh 14 lbs. I live in Oakland, CA. Personality: Marley is definitely a “people dog.” She loves meeting new people. She is also well socialized with other dogs. Since she was two months old, she has attended daycare at Happy Hounds daycare on the border of Oakland/Emeryville, were she regularly participated in play group and socialized with other dogs and multiple trainers. She has a very relaxed personality and loved to play catch, go to the beach and walk in our neighborhood. 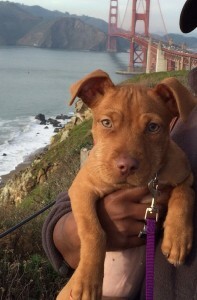 Breed: We are really not sure about her mix — All of her papers say “terrier mix.” I originally thought that she was likely a ridgeback and terrier (pit) mix, however, based on more research, photos, and crowd sourcing opinions (her groomer, her daycare provider, etc. ), people have guessed that the terrier is mixed with dachshund because she is small in stature compared to other puppies her age. Based on her forehead wrinkles, there is some pit somewhere in there as well. When I adopted her, they estimated that she would not be a large dog, but a medium sized dog. She is currently 14lbs. Training: Marley has completed a 6 week Puppy Kindergarten course. We are currently wrapping up another six week training course (Puppy II). She is still in the process of house breaking. When I am home all day, there are no accidents. She normally waits by the back door or stands in the middle of the living room staring at me for a prolonged period to indicate that she needs to urinate. When she is home alone, she uses the restroom on puppy pee pads. She is not at an age where she can hold her bladder all day. I have attached more pictures of her. She is incredibly smart and mild mannered. Marley’s Favorite Toys, Foods, Activities? Toys: stuffed animals and tennis balls. She loves to play fetch, go to the beach in San Francisco, and take long walks in her neighborhood. She eats Blue Buffalo organic chicken puppy food. People obsess about Marley everywhere we go. She is a favorite among the dogs at her daycare and gets stopped on the street by strangers all of the time because she is so friendly and adorable! Why is Marley Being Rehomed? A loving family that is specifically able to care for a young puppy.